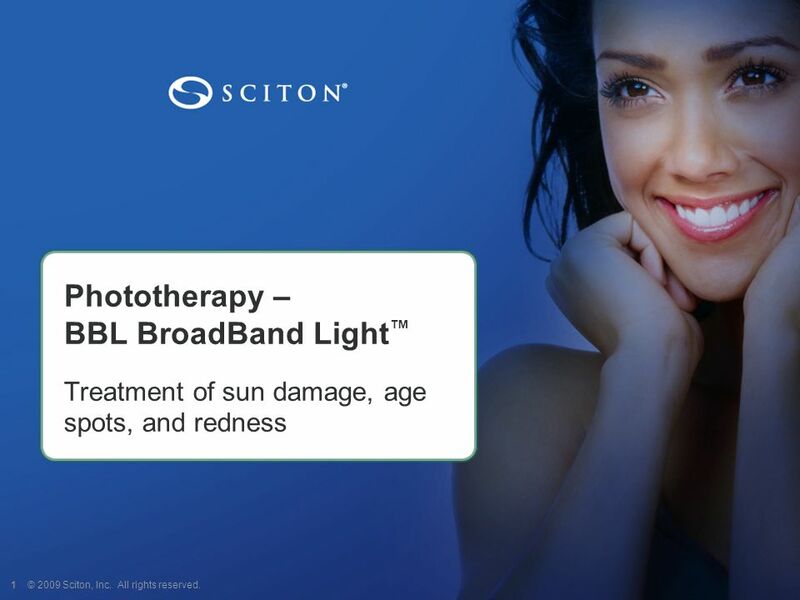 Treatment of sun damage, age spots, and redness © 2009 Sciton, Inc. All rights reserved. 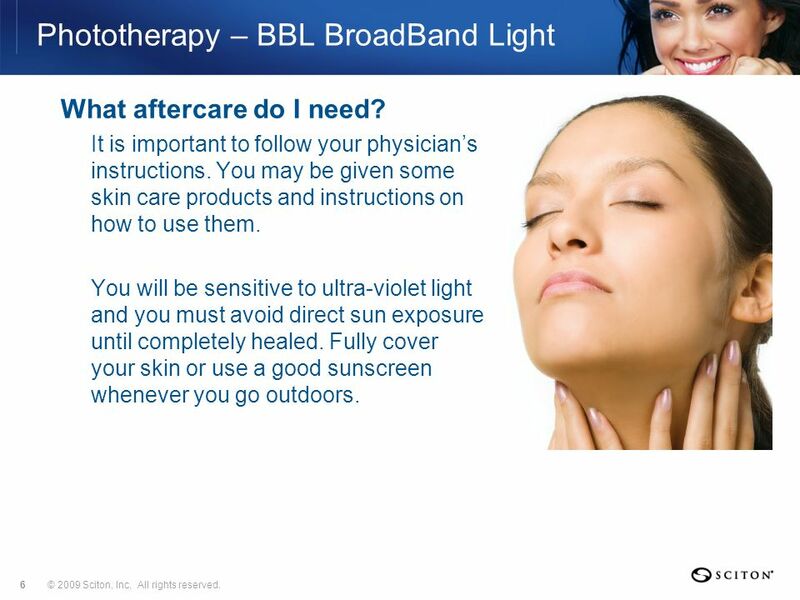 What is BBL BroadBand Light? 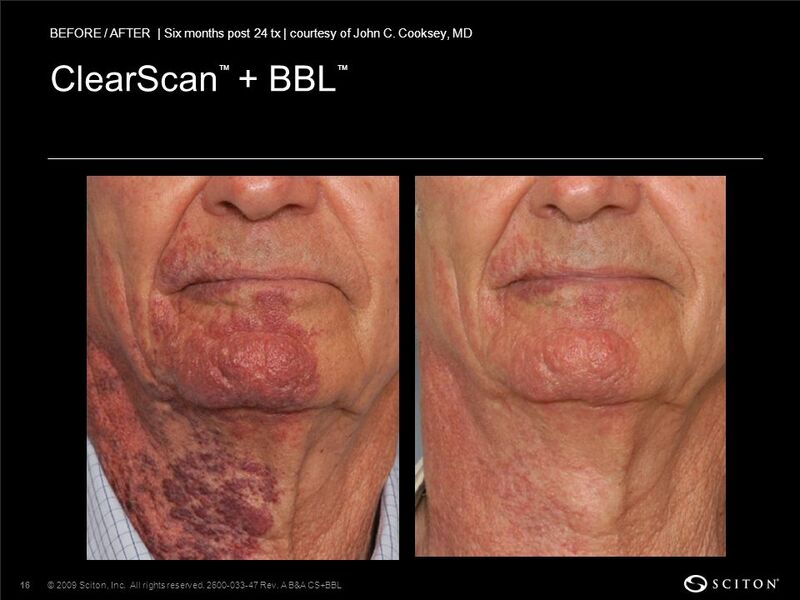 BBL is an innovative technology that sets new standards for skin conditions associated with aging, active life-styles and sun damage. 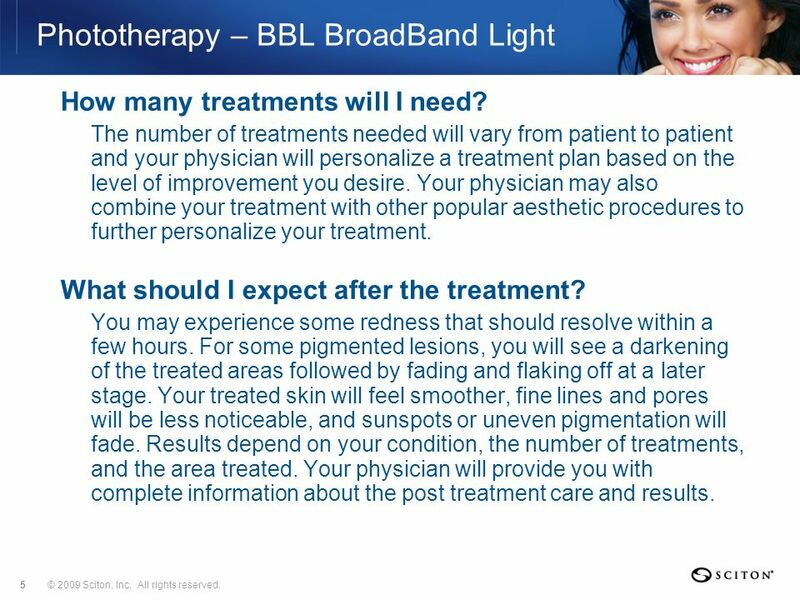 BBL energy allows your physician to precisely treat age and sun spots, small facial veins, and many other skin conditions. 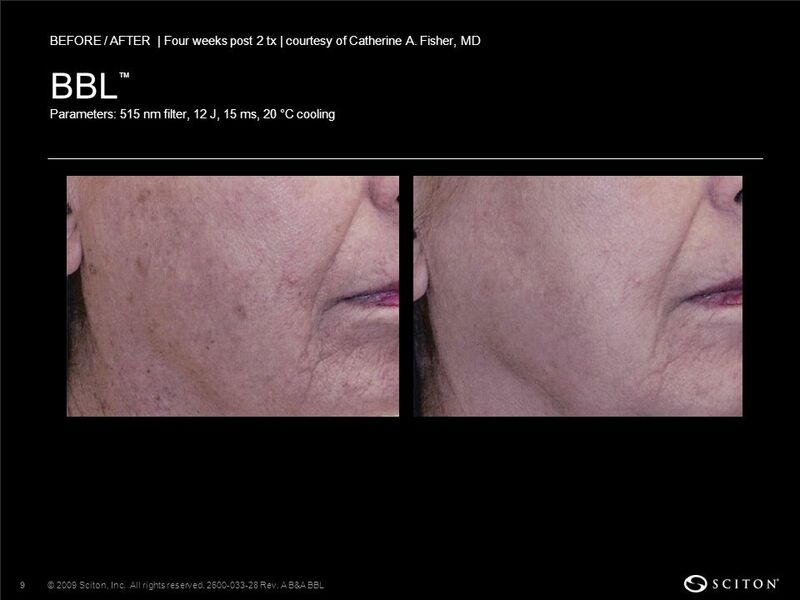 Your treatment will be tailored to match your skin type and your desired results. How does BBL work? 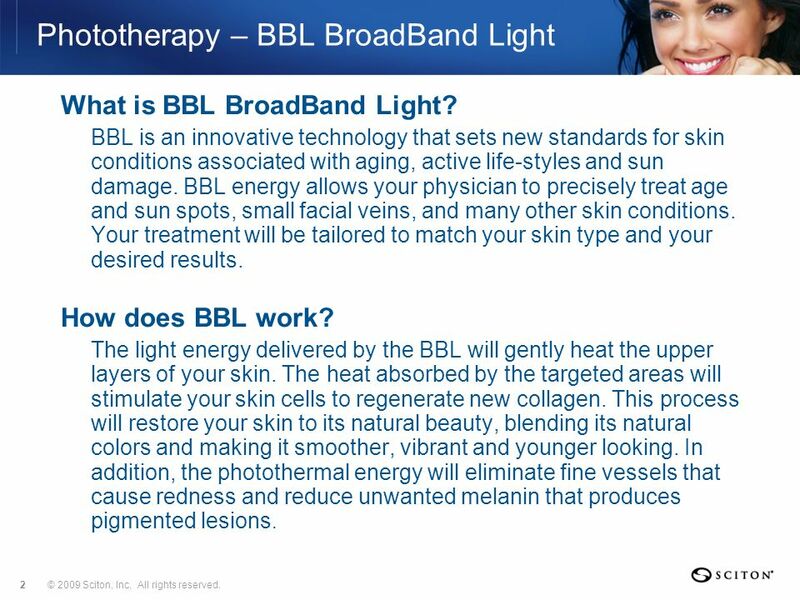 The light energy delivered by the BBL will gently heat the upper layers of your skin. 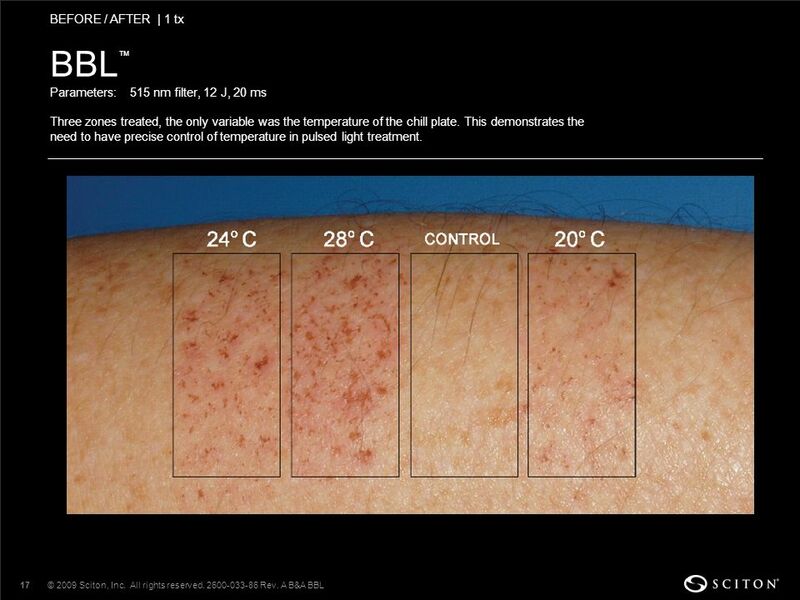 The heat absorbed by the targeted areas will stimulate your skin cells to regenerate new collagen. This process will restore your skin to its natural beauty, blending its natural colors and making it smoother, vibrant and younger looking. 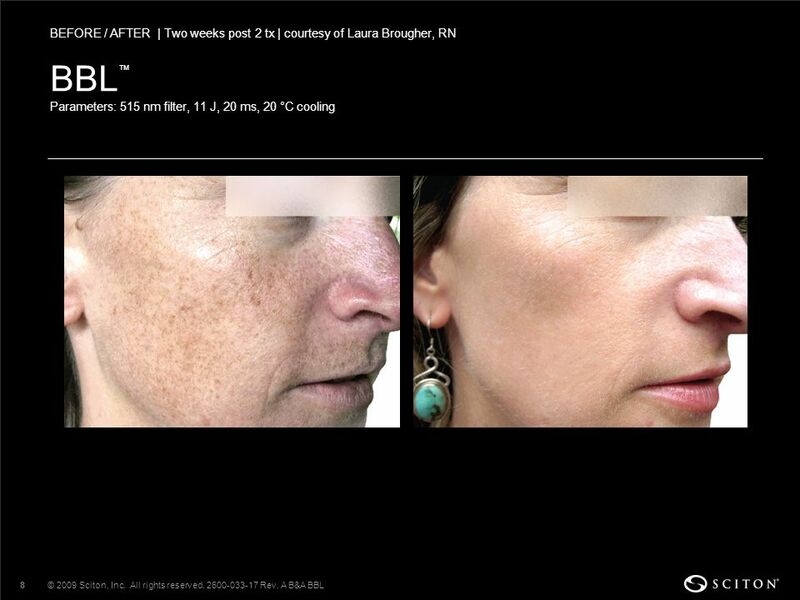 In addition, the photothermal energy will eliminate fine vessels that cause redness and reduce unwanted melanin that produces pigmented lesions. © 2009 Sciton, Inc. All rights reserved. 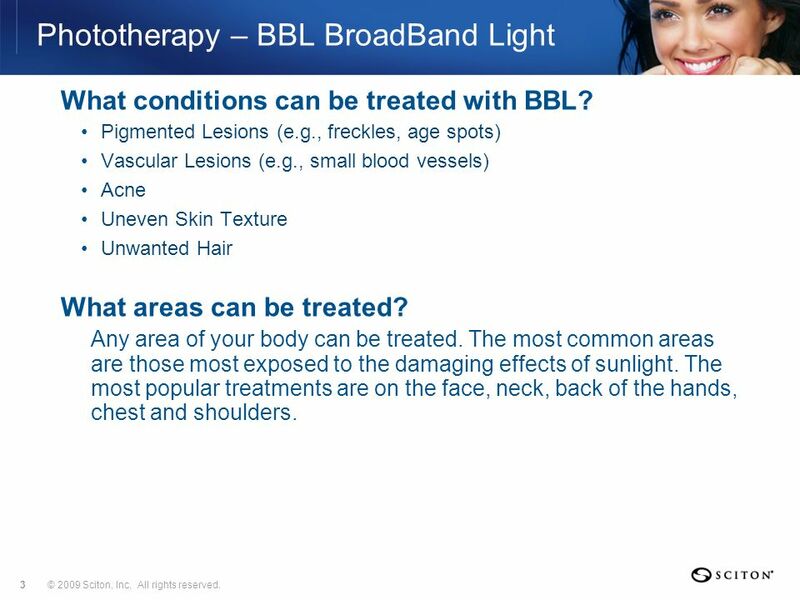 What conditions can be treated with BBL? Pigmented Lesions (e.g., freckles, age spots) Vascular Lesions (e.g., small blood vessels) Acne Uneven Skin Texture Unwanted Hair What areas can be treated? Any area of your body can be treated. The most common areas are those most exposed to the damaging effects of sunlight. The most popular treatments are on the face, neck, back of the hands, chest and shoulders. © 2009 Sciton, Inc. All rights reserved. What will happen during the procedure? Your eyes will be protected with safety shields or glasses. You may briefly feel a warm or “rubber band snap” sensation as the light is absorbed by the targeted areas. Your procedure may take a few minutes to half an hour depending on the size of the area to be treated and the type of procedure performed. Your physician will discuss all of your options with you. Will it be uncomfortable? 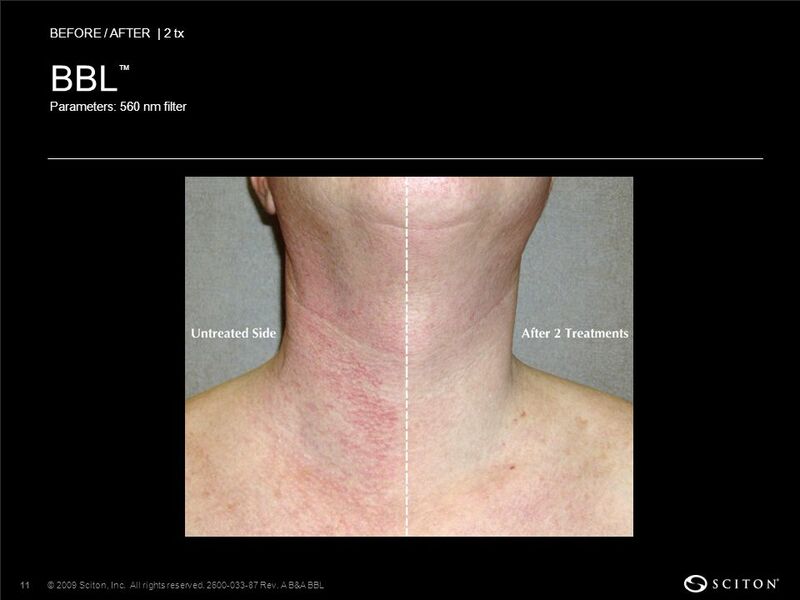 The procedure is gentle, noninvasive and safe. Generally, there is no need for a topical anesthetic, however, your physician may choose to use it on more sensitive areas. How long will it take to recover? 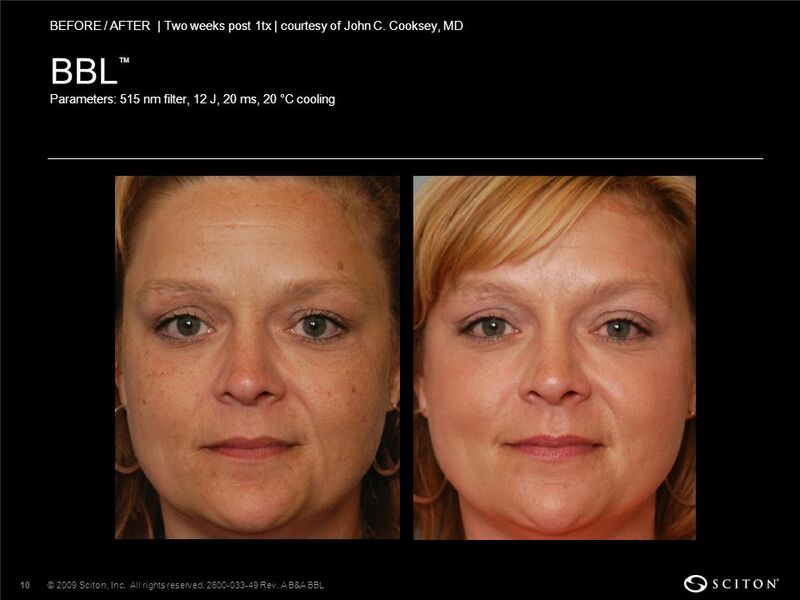 This is a noninvasive and gentle procedure with virtually no downtime. In most cases, you are able to return to work, apply makeup, and resume most of your activities immediately. © 2009 Sciton, Inc. All rights reserved. How many treatments will I need? The number of treatments needed will vary from patient to patient and your physician will personalize a treatment plan based on the level of improvement you desire. Your physician may also combine your treatment with other popular aesthetic procedures to further personalize your treatment. What should I expect after the treatment? You may experience some redness that should resolve within a few hours. For some pigmented lesions, you will see a darkening of the treated areas followed by fading and flaking off at a later stage. Your treated skin will feel smoother, fine lines and pores will be less noticeable, and sunspots or uneven pigmentation will fade. 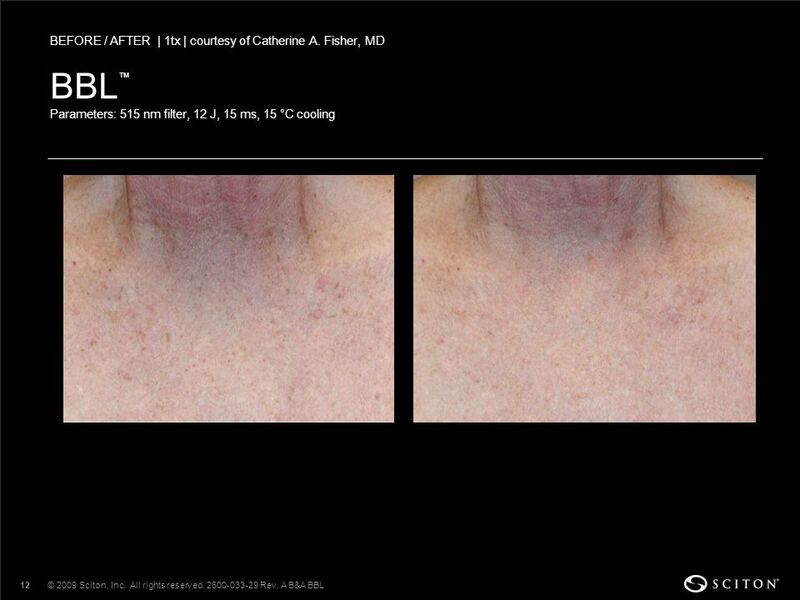 Results depend on your condition, the number of treatments, and the area treated. Your physician will provide you with complete information about the post treatment care and results. © 2009 Sciton, Inc. All rights reserved. What aftercare do I need? It is important to follow your physician’s instructions. You may be given some skin care products and instructions on how to use them. You will be sensitive to ultra-violet light and you must avoid direct sun exposure until completely healed. Fully cover your skin or use a good sunscreen whenever you go outdoors. © 2009 Sciton, Inc. All rights reserved. 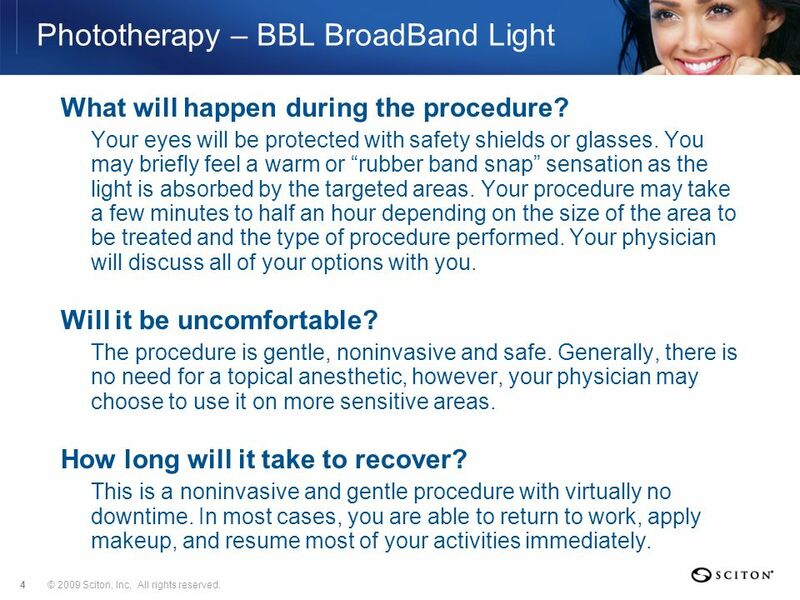 Download ppt "Phototherapy – BBL BroadBand Light™"
Pellevé RadioFrequency Skin Tightening & Wrinkle Reducing Treatment. This document and the contents hereof are considered proprietary and confidential information of ZELTIQ Aesthetics, Inc. Disclosure to unauthorized individuals. 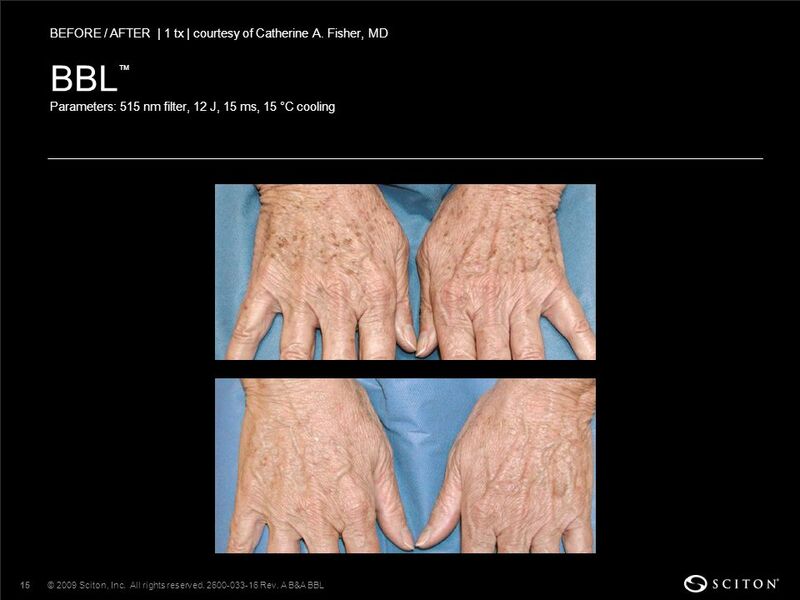 Golden Brown Summer Skin Dangers of Indoor Tanning Sunless Tanning Safety and Review. FIGURE 6.1 The electromagnetic radiation spectrum covers everything from very low frequency (VLF) radio to X-rays and beyond. Curtis Johnson Process. 1. 2 We develop and manufacture home RF systems. (We have developed wireless face & body care devices by RF first in the world). SUNBURN TENDENCIES IN GEORGIA Nona Magradze Mariam Rukhadze Mariam Izoria Sopio Aspanidze Masters of University of Georgia Tbilisi, 2013. 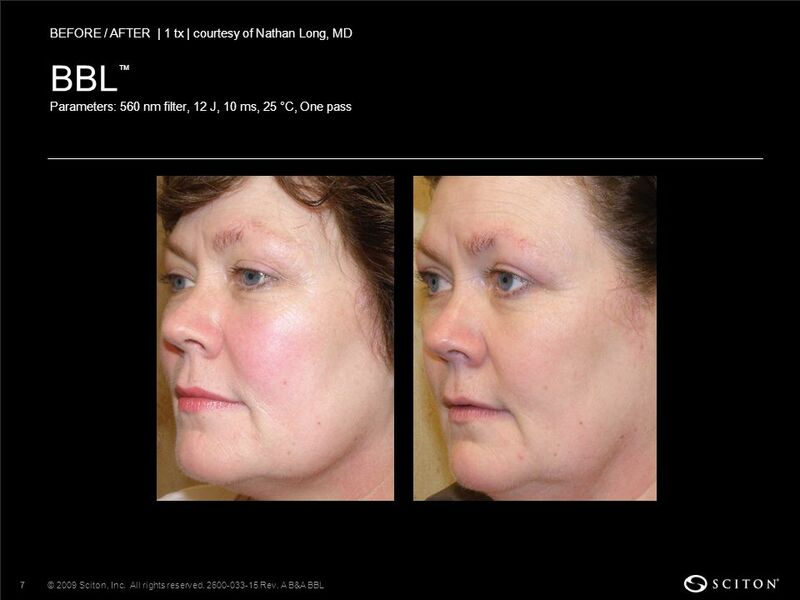 Restylane and Restylane (stylized) are registered trademarks of HA North American Sales AB. © Medicis Aesthetics Holdings Inc. RES04089AR Innovations. Where to Buy How Neutriderm Works Professionals HyperpigmentationHyperpigmentation Pigmentary Disorders Home Customers Voice Buy Now Contact Home >> Pigmentary. 4 Joseph Lepselter, Director Clinical Department March 1, 2012 DRAFT CONCEPT. 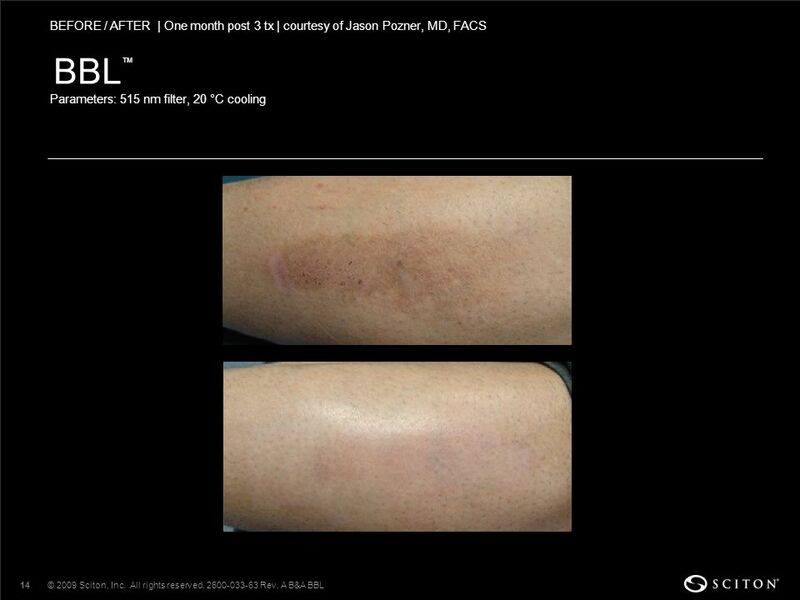 Laser Hair Removal. What type of hair can laser hair removal treat? Hair anywhere on the body can be treated. The laser targets melanin (color), and black. 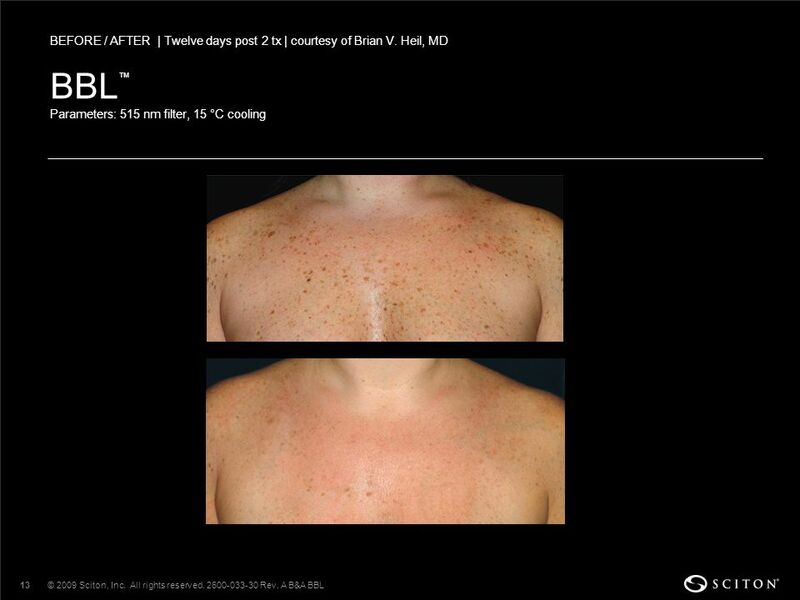 MicroLaserPeel ® The easy and effective way to improve skin texture & appearance.